Few days ago I received a ATmega8A Development Kit from ProtoStack. 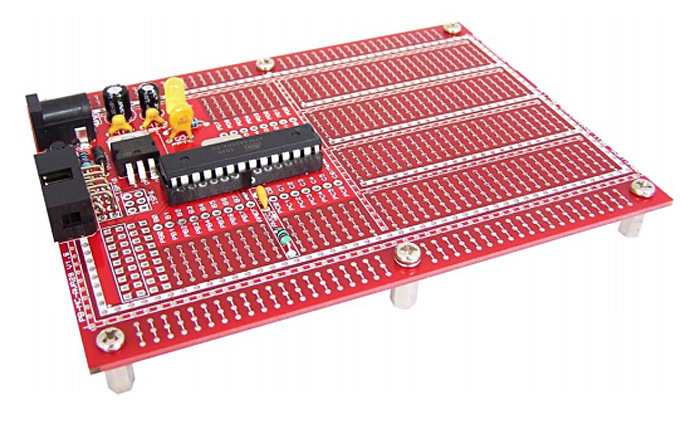 The board is well made, and it has everything you need to start developing any kind of project using the famous Atmega8, which is the same µC used by the first Arduino. Actually, you can also use this board with different µC’s such as Atmega168 and Atmega328 (used in Arduino UNO). The kit have a lot of space to add more components, and a good thing is that the VCC and GND voltage is easily accessed everywhere of the board. On the pictures and the video I posted here, I have connected the output pin PB2 to an resistor, green LED and to the ground, even without soldering the board works great.